The powerful documentary filmed by Freida Mock, partially in Columbia at our 20th Annual Anita Hill Party, was released last spring. The film sold out at select theaters. 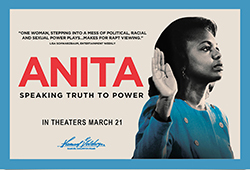 See all events online at Anita Hill Film. Share the trailer with friends. Seventeen years after delivering sexual harassment testimony against Clarence Thomas during his Supreme Court Senate Confirmation hearings, Professor Anita Hill is returning to her history. More than 25,000 letters from across the globe have been sorted and filed over the years since those hearings, and Professor Hill has begun reading them. View the video of Hill’s research at Brandeis today.